Have you ever pictured what the band KISS would be like without costumes? What the Super Bowl would be without the half-time show? Or what Trump would be without controversy and orange hue and a comb-over? Frankly, not nearly as entertaining. Our guess is that KISS would have sold fewer tickets, the Super Bowl wouldn’t be on TV, and you’d see a lot less Trump gag gifts & Instagram memes! Same goes for a sports team without a mascot. They are simply…less entertaining. Whether you’re an NFL team, university team, community team, or a corporation, a mascot elevates your brand. Not only do they add entertainment value, but they give your brand more heart and personality. But that’s not all… Check out how having a mascot can help your team or organization. Ok sure, your team is great, sure they’re entertaining, but what about those down times? A great mascot fills in the gaps from pre-game to intermission to injury breaks, your mascot keeps people engaged and entertained. Your mascot can be active in the community in a way that just isn’t possible for players. A mascot’s sole job is to be entertaining and huggable, and they are darn good at it. They can bring your team’s friendly presence to local kid’s events, street festivals and community parties, increasing awareness and goodwill for your brand. 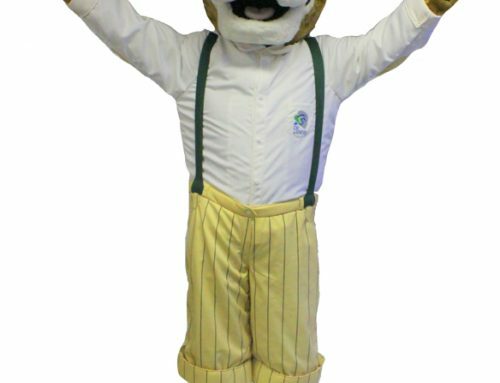 One thing that marketing teams don’t often think about when they’re considering a mascot is that your mascot could be sponsored! There are tons of companies who are eager to put money down to have their name on the community idol. Your team may not have a newsworthy night, but your mascot might. Don’t believe us? Fox News and Huffington Post picked up this viral mascot kiss-cam video for the Chicago Bulls match that got little-to-no coverage. Believe it or not, mascot swag sells! From t-shirts to hats, golf club covers, statues and even dog toys, state, community and professional teams are selling mascot gear. If you aren’t getting in on mascot merchandising, you could be losing out on revenue! So if you’re looking for examples of how to utilize a mascot to your benefit – follow us on all our social platforms to see what our mascots are doing! If you are without a mascot and have been contemplating taking the leap, drop us a line or send a note and we’d be happy to chat with you or better yet show you our work! In the meantime, CLICK HERE to check out our current clients and their mascots!